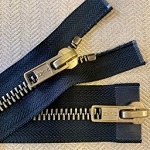 Metal toothed zippers are made out of aluminum, brass, pot metal, titanium. 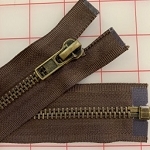 Metal zippers used to be the strongest zippers available, but not any more. Just like EVERY zipper, there are good ones & cheap ones! 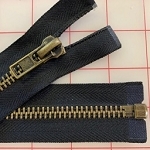 I have picked these zippers for the quality! But all zippers wear out! Metal zippers always can use a little help. Use beeswax to keep them running well: a candle, or Burt's Bees lip balm, or a product made specifically for zippers. Rub a bit on the open teeth, then open & close the zipper a couple of times. Nickel on Lt. Tan - 26"
Nickel on Lt. Tan - 32"
Nickel on Light Tan - 79"
Brass on Tan - 36"
Brass on Brown - 26"
Brass on Brown - 36"
Nickel on Gray - 26"
Nickel on Gray - 32"
Brass on Gray - 36"
Brass on Gray - 32"
Nickel on Navy - 26"
Nickel on Navy - 32"
Brass on NAVY - 36"
Nickel on Black - 26"
Nickel on Black - 32"
Nickel on Black #5 w/ Round Pull - 26" or 32"
Brass on Black #5 w/ Round Pull - 26" or 32"
#10 Antique Brass on Tan - 18", 26", 30"
#10 Antique Brass on Gold - 18", 26", 30"
#10 Antique Brass on Brown - 18", 26" or 30"
#10 Antique Brass on Black Jacket Zipper - 18", 26", 30", 36"